Faridmarandi, N., Shirzadi, F., Golzardi, F., Mojaradi, T. (2014). Study Allelopathic Effects of Aquatic Extracts of Swallowwort (Cynanchum Acutum L.) on Germination and Seedling Growth of Wheat. International Journal of Advanced Biological and Biomedical Research, 2(Issue 4 (2)), 208-225. Nazanin Faridmarandi; Fatemeh Shirzadi; Farid Golzardi; Tahereh Mojaradi. "Study Allelopathic Effects of Aquatic Extracts of Swallowwort (Cynanchum Acutum L.) on Germination and Seedling Growth of Wheat". 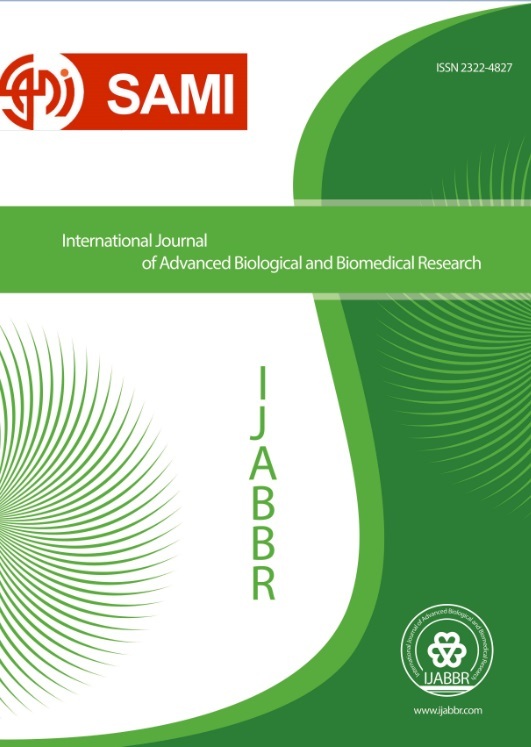 International Journal of Advanced Biological and Biomedical Research, 2, Issue 4 (2), 2014, 208-225. Faridmarandi, N., Shirzadi, F., Golzardi, F., Mojaradi, T. (2014). 'Study Allelopathic Effects of Aquatic Extracts of Swallowwort (Cynanchum Acutum L.) on Germination and Seedling Growth of Wheat', International Journal of Advanced Biological and Biomedical Research, 2(Issue 4 (2)), pp. 208-225. Faridmarandi, N., Shirzadi, F., Golzardi, F., Mojaradi, T. Study Allelopathic Effects of Aquatic Extracts of Swallowwort (Cynanchum Acutum L.) on Germination and Seedling Growth of Wheat. International Journal of Advanced Biological and Biomedical Research, 2014; 2(Issue 4 (2)): 208-225. A laboratory experiment was conducted to determine the allelopathic effect of residues aqueous extract of two ecotype of swallowwort(Cynanchum acutum L.) on germination traits of wheat (Triticum aestivum L.). A factorial experiment based on a completely randomized design with four replications was conducted at Islamic Azad University of Karaj in 2012. Factors were two swallowwort ecotype (Ghazvin & Moghan), three kinds of tissues (shoot, root and shoot + root) and five concentrations (0, 25, 50, 75 and 100 %) of extracts. Polyethylene glycol (PEG) was used to distinguish between the inhibitory effect of possible allelopathic substances and effects caused by the osmotic potential of the extracts. Results showed that aquatic extract of swallowwort showed different allelopathic effects on germination and seedling growth of wheat. The germination percentage, shoot & root length and seedling weight of wheat decreased with increasing concentration of swallowwort residue. Different concentrations of PEG had no significant effects on studied germination traits, therefore inhibitory effects of extracts can be attributed to an allelochemical effect.